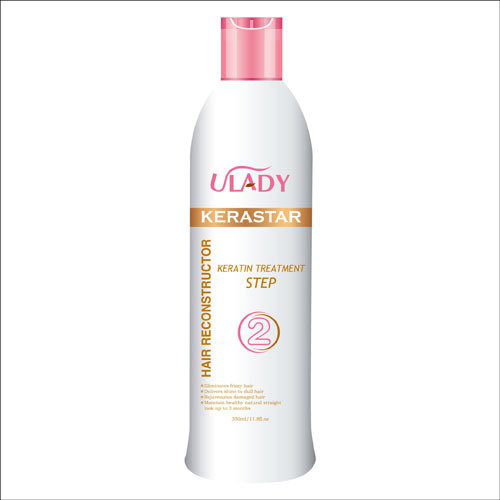 Coated with natural keratin, the KeraStar Keratin treatment is a unique hair treatment that restores hair to its natural straight and shining beauty. It can eliminates frizz, smoothes, repairs, and moisturizes dry & damage hair, leaves hair straight, soft, shiny, and healthy for up to 3 months. It protects and regenerates damaged hair from heat, harsh chemicals, UV and environment pollution. It works on all hair types and hair extension. 1. After pre-treatment shampoo, blow dry hair to 95% dry. 2. Section hair into there or four parts, then use a tint brush to spread keratin on hair from roots to ends. (DO NOT touch scalp and keep away from face). Comb through every section until hair is completely saturated. 3. Place hair in cap. 4. For chemically-treated or damaged hair, allow hair to absorb the keratin for 20 minutes and blow dry hair to 100% dry. For very resistant, coarse hair, allow hair to absorb for 30 minutes and blow dry to 100% dry. 5. Starting at the nape of the neck, take 1/8 inch sections, slowly move the flat iron (450°/230°C Fahrenheit is recommended) from root to ends 5~7 times (7~10 times for extremely curly coarse hair) to infuse the KeraStar keratin treatment into the hair shaft. For chemically treated or damaged hair reduce heat to 430F°/ 220.